Today, we’re talking Valentine’s Day parties! I’m Stephanie Pasutto, the owner of Fourth + Hazel Photography for AWESOME kids in Sherwood Park, Alberta and I am super excited to be blogging on Spaceships and Laser Beams. Valentine’s Day is coming soon and I wanted to share some awesome FREE printable valentine cards you can make with your boys. Check out the fun touches in this King of Hearts boy’s Valentine party. You’ll adore this super hero Valentine’s party — any boy would go crazy for it! As a mother of two boys myself, I am always looking for something they would be excited to hand out and ones that are not too “lovey” (not that there’s anything wrong with it :). I’ve compiled 21 of my favorite printable valentine cards and hope that your son will be just as happy making them as he will be handing them out. These video game valentines are perfect for the video game lovers out there. Simply print and cut these free valentines and gift as is, or add a piece of candy for added fun. These would be perfect to hand out to classmates or friends this February! Boys will love sending out these monster valentines. Too cute to be scary, they can be printed right from home as a free download. Not only are these fun to hand out, they can play with them after. These adorable valentines turn in to finger puppets so your boys can run wild with their creativity playing with these. Looking for a non-candy valentine with entertaining value? These printable maze valentines are pretty “ah Maze ing”! This will give kids a fun activity to keep them entertained after they go through all of the candy they get from other valentines! Distribute them with a cute Valentine’s Day pencil attached. Star Wars lovers will get a kick out of these forceful valentines inspired by Star Wars. Add a glow stick “lightsaber” for an out-of-this-world look. Your boys will think these are amazing! They will be sure to impress all of their classmates and friends with this fun craft. Little ones will enjoy coloring Valentines for family and friends so hand out a pack of crayons with our printable for an extra-sweet surprise. Let everyone color their own Valentines this year for some creative fun. 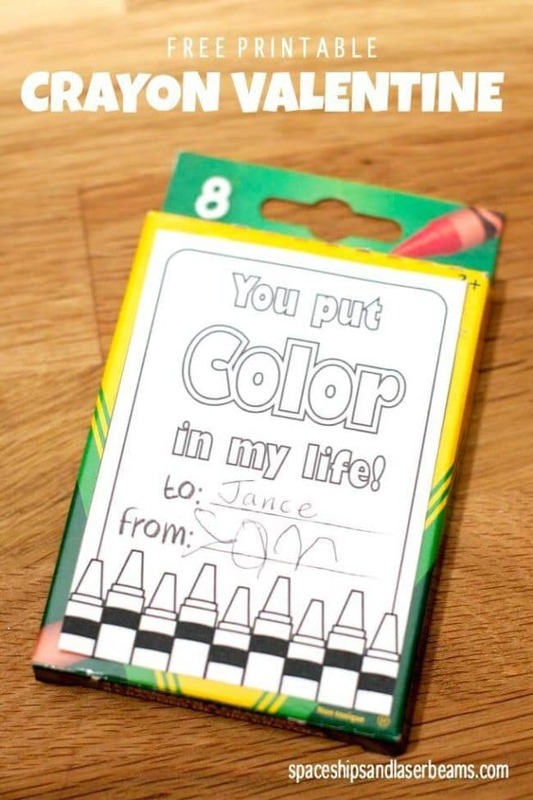 Crayons are a fun treat and different from other valentines that include candy. Find 70 puny valentines to personalize according to each recipient’s interest. All are good for a grin and some might inspire a droll gift idea, too. I mean, who doesn’t love a good corny joke on an already somewhat cheesy holiday? Choose from four free printable valentine options that are particularly well-suited for boys. Whether your boy likes superheroes, dinosaurs, construction trucks or robots, there are four fun designs perfect for classroom delivery. Let them pick their favorites and sign away so they’re ready to hand out this February. If your son wants to gift a fun toy with his valentines, this “Have a ball” printable valentine is a great choice! Package up bouncy balls and attach the cute topper. Quick and easy can’t be beat! Plus, kids are sure to love a fun toy with their valentine! Here’s another non-candy Valentine idea that is sweet as can be and useful, too. I mean, what child wouldn’t love a fun eraser? Find a pack of fun shaped erasers at the dollar store for a cheap way to put these valentines together. Love is in the air (or at least can be)! These printable paper airplane love notes are genius. Print the airplane template. Record a love note or valentine message, and then follow the fold lines to create your paper airplane: air mail! Put those tiny candy hearts to use this Valentine’s Day! This Conversation Heart Tic Tac Toe printable can function as both a valentine and a fun party game. Add a washi tape tic tac toe board to the printable and package up Conversation Hearts in mini glassine bags. Everything’s fishy about these fin-tastic valentine cards! 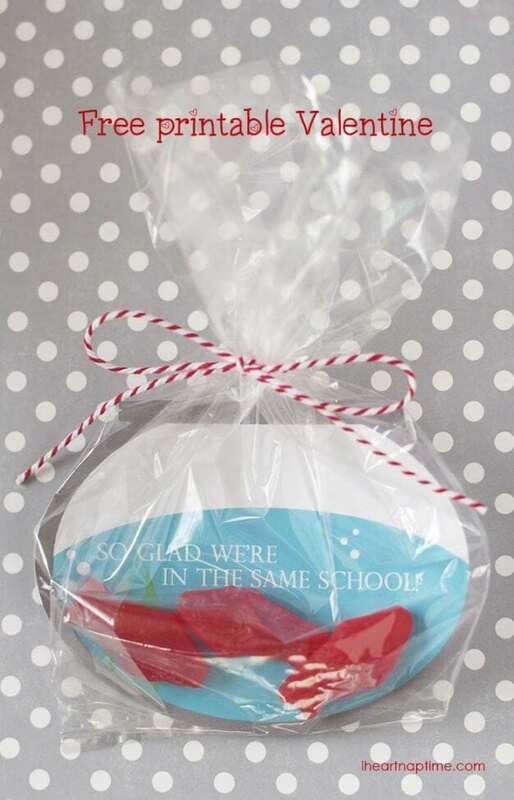 Print them and package them up with your favorite gummy or snack fish. These would be easy and super fun. Have your boys help put these together by putting the fish in each bag. 13. Arrrh you my Valentine? This free printable paratrooper toy valentine is perfect for any boy who likes throwing toys or playing with Army guys! Plus how cute is the printed sentiment, “Dropping down to wish you a Happy Valentine’s”? These are sure to be popular among the boys in your child’s classroom this year! 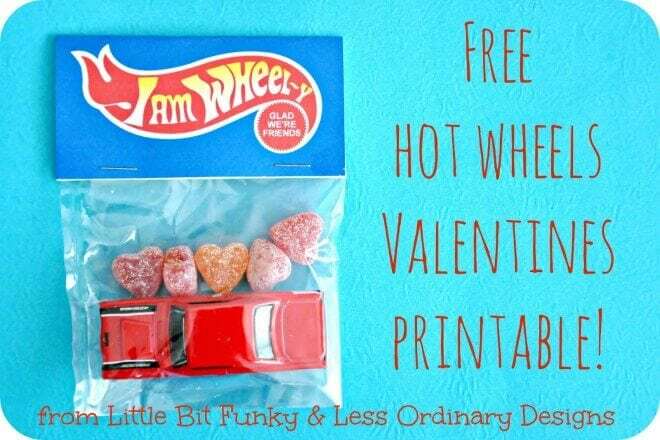 Add a toy car and maybe a little candy and your guy will “wheel-y” be happy to hand these out. All boys would be excited to not only get candy with their valentine, but a fun toy as well. Your boys’ valentines will be the talk of the classroom! A valentine card that is also a toy? You betcha! Just print, cut, fold and tape these valentine card creatures! Record a secret valentine message underneath the back card flap. These free printable dinosaur valentines are definitely dino mite! Pick your child’s favorite candy to attach and have them help out in putting them together. They’re super simple — just print the free templates and add your favorite candies. It’s a fact: boys like just about anything that rolls. These “I like how you ROLL” printable valentines are perfect for gifting to boys! Add a small dollar store vehicle with wheels in place of a treat. You don’t need a printable for this fun space–themed valentine, “You’re out of this WORLD” Shaped like a heart with a cool outer space vibe, the attached bouncy ball looks like a cool planet! Turn this valentine craft into family fun by letting your boys help put these together by having them cut the hearts out and write the messages on each one. Add some humor to Valentine’s Day ‘cause everybody loves a good laugh. These valentines come with jokes printed on each box! Pop in a favorite candy or small toy for some extra fun, but the most fun comes from the joke printed on top. 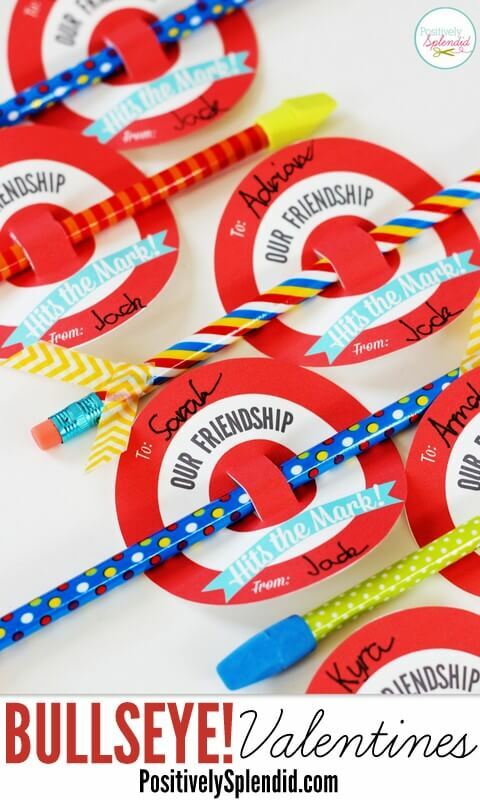 Hit the mark with these bullseye target printables and add pencil arrows, eraser arrowheads, and washi tape feathers. These would be super simple to whip up in no time and it would be easy to find a pack of inexpensive pencils at your local dollar store. Clever! Celebrate Valentine’s Day with these great resources gathered by the team at Spaceships and Laser Beams.